Hi guys! How was everyone’s week? 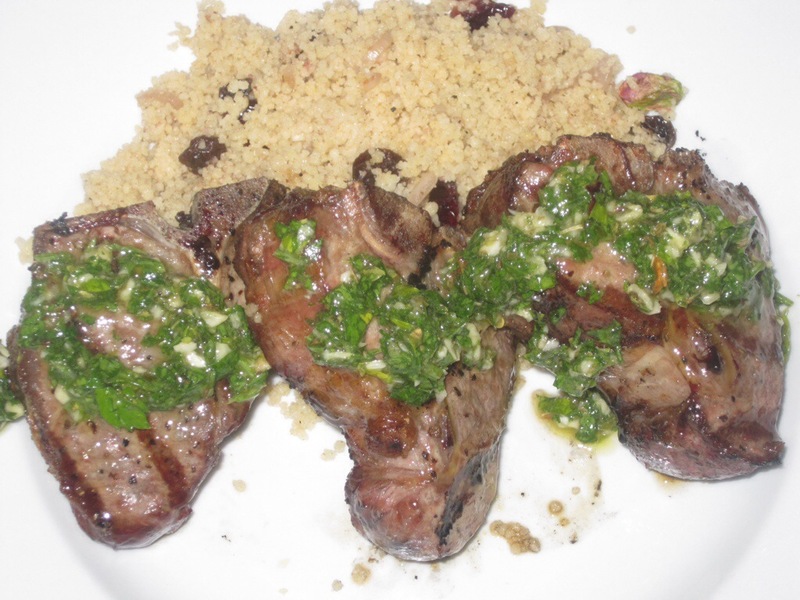 I have a good one for you here – lamb chops with chimichurri sauce! I know a lot of people out there are a tad scared of lamb – both cooking and eating. If you’ve never tried it, forget about the term “gamey” or anything else. Lamb, in fact, tastes very, very similar to beef. I actually think beef has a more “gamey” taste than smooth, flavorful, mild lamb does. My husband has on occasion been weird about lamb. But a couple of months ago I made him lamb burgers (I just called them “burgers” in front of him – sneaky sneaky) and he went nuts for them. My 6-year-old absolutely loved them too. Although lamb isn’t obscure here in America, it seems like it isn’t too common either. It seems that major foodies (guilty) and people who have it in their heritage are the ones eating most of it. So unless it is really against your eating philosophy, I would really recommend trying it. Lamb is common in many parts of the world, including parts of Europe, South America, and the Middle East. It’s important to remember that where you get your lamb matters. Costco has excellent quality lamb regularly. I love Trader Joe’s, but I feel like their fresh meat is extremely over-priced for its quality. I really think the best way to go is find a meat vendor who sells it locally – like a butcher (they do still exist and can be a fantastic resource), a local farmer’s market (one of my favorite ways) or look for a farm online that will ship. With any of these three choices you can easily find out about where the lamb is coming from and how it is treated every step of the way. We all have our own personal standards for these kinds of things. Now for the chimichurri sauce. It hails from Argentina and is usually put on some type of meat. I have used it to marinate chicken, seafood, etc., but it is best on lamb – something that can stand up to the flavor. Chimichurri is a raw sauce – no cooking whatsoever. All you have to so is put all ingredients in a blender and push a button. Lamb chops are incredibly rich, like eating a steak. So we need something fresh, astringent and clean-tasting to pair them with. I also have included a bonus printable recipe for my sweet & savory couscous that you see in the pictures. It’s delicious and goes perfect with all kinds of things. More importantly – it’s incredibly easy. Lamb chops can include several different cuts of meat so it’s important to check the label. I prefer loin chops, but rib or sirloin will also work. The rib chops are what ‘rack of lamb’ is made with. The rib bone is long and almost makes the chop like a little lambsicle. If you end up getting the rib cuts you can ask your supermarket butcher to make them “French”, which means he will clean some of the meat off of the bones. I find the loin chops are the easiest to work with. Plus they are always tender and have the perfect fat to meat ratio. Lamb chops are small by the way – they aren’t like pork chops. One serving is about 2 to 3 lamb chops. Curley parsley is also acceptable. I prefer the flat leaf because its flavor is more fresh. Dried parsley is a big no-no for this dish. The chimichurri is a raw sauce, and being the main ingredient, the parsley must be fresh. Fresh oregano isn’t always available. And to be honest this is one herb that fresh really makes no difference in flavor. Just make sure that you use the right amount, as dried herbs have a flavor that is much more concentrated (and oregano can be strong anyway). Again, this is a raw sauce we are making. So we want the most flavorful, delicious, luxurious oil we have. EVOO is the classic for this sauce, but if you have another you’d like to try please go for it. I would stay away from oils like saffola or canola though – they are too heavy and not enough flavor. This is of course optional. You can add none or more depending on how hot you like it. Make sure your dried pepper flakes are still red. If they have developed a brownish hue then they are stale and probably don’t have much heat. Take lamb chops out of refrigerator and set aside. Whenever grilling or cooking meat we want to take the chill off of it. Putting cold meat on a hot surface makes it seize up which means we lose lots of tenderness. The food industry standard is meat (not fowl though) can be left out for up to 2 hours safely. I try to get as close to that as I can but it’s not always possible. If you can have it out for at least 15 minutes it’ll be great. In a blender or food processor, add the parsley (stems included if you like), garlic, oregano, and red pepper flake. Add a pinch of salt and pepper. Pulse on & off for about 30 seconds to give everything a rough chop. The stems are perfectly edible and yummy but usually I just use the leaves. Add olive oil & lemon juice. Puree on high until desired consistency. Do a quality test and adjust seasoning if needed. Pour into a bowl and set aside. You can make it as chunky or pureed as you prefer. I like it somewhere in the middle. I also like to use any leftover sauce for a chicken marinade. Pat lamb chops dry with paper towel. Wait to season with salt & pepper until right before cooking. Season all sides with salt and pepper. We want the chops surface dry so that it sears well. If you are concerned about it sticking then drizzle with a little oil just before seasoning. Salt pulls moisture out of things – which is why we are waiting until the last minute to season. The meat will be seared, sealing in the juices, before the salt can pull it out. Then we will be left with nothing but amazing flavor. Grill: cook on medium-high heat for about 4 to 6 minutes on both sides. These instructions are for medium-rare (pink in the middle). If you want it more well-done then give it an extra minute or two on each side. If you want it rarer then shorten the cooking time. Oven: heat skillet on high with a tablespoon of olive oil until smoking hot – literally. Sear both sides for 30 seconds each then place in a preheated 450 degree oven for 5 minutes. After either cooking method, once cooked place on a plate and cover with foil. Allow to rest covered for 5 to 10 minutes. Letting your meat rest is a crucial step. Giving it that time lets all the juices redistribute throughout. If we were to cut into these immediately all those juices would run out taking the flavor with them leaving a dry, chewy piece of meat. No bueno. Top with chimichurri sauce, serve, and enjoy! Thanks so much for visiting me this week! I hope you try this and/or any of my recipes. And if mine don’t work for you then find some that do. Just try to do what you can. It’s pretty hard to completely change overnight. If you are just starting out, take baby steps – eventually you will get there. Try just cooking one time a week and increase as you go. And I am always here, happy to help answer any questions you have. Recipes coming up soon: kale & cannellini ravioli, macaroni and cheese, sweet potato pancakes…..lots of freezer friendly! Thank you for reading my recipe! I have also included a printable version of this recipe without all my witty repartee (ha-ha!). I hope you enjoyed it enough to try it! If you have questions or comments leave a comment on the post and I will happily answer it.